It’s Summer 2014 in sunny San Diego — where the one and only HostingCon gave me the excuse to make my first trip to the West Coast. 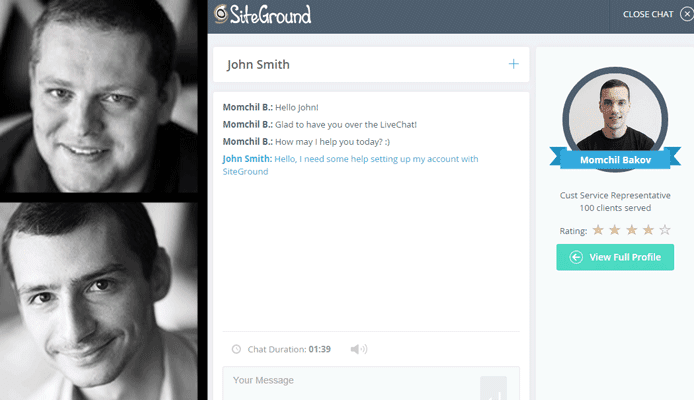 I have a lot of great memories from that event, but one that stands out for me is a conversation over drinks and an impromptu demo of proprietary Live Chat software, courtesy of SiteGround’s Founder and CEO. As the two tech-loving, customer service-minded Russians sipped their espresso and shared with us the technical nuances of their in-house-built Support Ticketing System, I felt their passion for empowering customers with powerful hosting solutions. I could tell this host was a force to be reckoned with, and I couldn’t wait to get my hands on their WordPress hosting. Our SiteGround WordPress hosting review revealed a lot — namely that the in-house innovations and the team backing them are market-leading. If nine nines for an uptime guarantee (99.999%) doesn’t impress you (it should), then the multiple layers of caching, WordPress staging, and Git versioning control will. Designing your dream site, powered by WP, is super simple with SiteGround. WordPress themes are available by the boatload — both premium and free options — and it only takes a few intuitive clicks to get your site’s template downloaded and installed. Are you running a burgeoning business and in need of an eCommerce theme? What about the artist types out there who want an aesthetically dynamic online portfolio? Maybe you just need a few pages to connect with potential clients for a freelancing side gig. Whatever your web need, you can bet there’s a theme for it. If you’re on the hunt for a killer website design, this article features the best WordPress themes, plugins, and templates. Your dream SiteGround site could be a reality in minutes. Needless to say, we’re big fans of SiteGround support. If the Live Chat demo in my intro didn’t make that clear, the “Best 24/7 Support” recognition we awarded SiteGround should. SiteGround Founder Ivo Tzenov (top left) and CEO Tenk Nikolov (bottom left) gave us a live chat demonstration. Support Ticketing System uses an advanced algorithm to match tech ops team members with support tickets based on skill and experience. Live Chat System gives customers access to on-call support experts 24/7. They can return to previously helpful agents with future questions and offer feedback on the service provided. WordPress Tutorials via videos and online guides get you through any WP hiccup. SiteGround’s 1-click cPanel installation for WordPress is super easy to execute. If you get stuck, though, SiteGround has WordPress how-to tutorials for beginners available. Just follow their online video lessons and you’ll be a WordPress pro in no time. If you’re transferring from another host, SiteGround’s migration team makes the transition to their WordPress hosting platform seamless. What’s more, you’ll get all the hosting essentials: free domain registration, cPanel license, and CloudFlare CDN. The team has covered all of their bases in ensuring users a hassle-free, WordPress-friendly hosting experience. Ranked one of the top email hosts, SiteGround offers unlimited email hosting at the free domain you get with signup. If you’re a business owner, signing up for SiteGround WordPress hosting may be your best investment yet. Their plans are ideal for business email hosting shoppers. Hosting packages include secure email protocols, email forwarding, and integrated anti-SPAM filtering solutions. Plus, the SiteGround email platform is compatible with many webmail and email clients, such as RoundCube and Outlook, so they fit any business email need. Sipping drinks in San Diego or sifting through WordPress reviews, my findings are consistent: SiteGround is a host to be reckoned with in the WordPress web hosting space. Their support is unbelievable, your site will be speedy and secure, and the uptime rates are what most hosts strive for in the industry. When you’re ready, upgrade to SiteGround’s cloud hosting or dedicated servers for WordPress. As your WordPress site scales, so will your love for SiteGround.